Since we are on the subject of candy because of Halloween, I want to introduce you to one of my favorites. It is just a dried fig, dipped in dark chocolate, with a little bit of coarse salt shaken on for a finishing touch. You know those chocolates that feature salt and caramel? This fig concoction gives them a run for their money AND you are eating a fig instead of caramel. I have seen these as a choice in the chocolate aisle of Whole Foods where I spend too much time, but there is no reason to buy them pre-made. They are so easy to make! Those look amazing! I'm trying them! These are delicious!! I always seem to crave salty/sweet combinations; these fit that bill! Do you store them in the fridge, or on the counter? My mouth is watering. I'm making these today, and for Thanksgiving and for Christmas, and then maybe because the "day" ends in the word "day." Thank you! Yum! These look fabulous!!! Great healthy snack! I have a fig tree and unfortunely it had a ruff year and bloomed really late so my figs never fully ripened. This would be a perfect recipe for them since I found no figs in my local grocery. That's YUMMY!!! I want them!! They look so heavenly. Too good. Dried figs are a stable in any Italian household. How do we enjoy them? 2. placed in a jar with a good orange flavored liqueur and large pieces of orange rind - let it sit for a few months. Both yummy! Talk about yummy-looking! Can't wait to give these a try. Oh yum! The best place to buy figs is at a middle eastern food store. 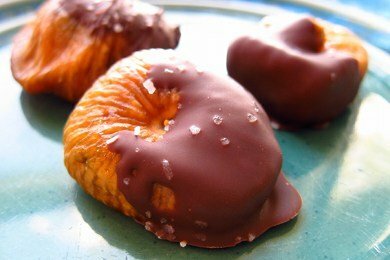 What a lovely twist on salted caramels! So creative. Plus, I will feel very fancy enjoying a dark chocolate-dipped fig. Well that's something I'm going to have to try. Could make for a fabulous Christmas gift. So I looked at Walmart and found dried figs in a box with prunes etc for $1 it has a small amount but perfect price for sampling. I did try this at home but the only choc. I had was semi sweet and while it was good based on a hunch the snack girl is right dark choc would taste better. I bought some dried figs from Nuts.com and they are great and priced within reason. I'll have to try this confection! You might also want to try a prune stuffed with a walnut and chocolate dipped. I made these this weekend, I was skeptical but I should have known Snack Girl would not lead us astray. They were delicious! These are horrible. I made them for a Christmas party I had last night and every single fig that was tried was immediately spat out into a napkin. I don't understand all of these comments praising these things, they were absolutely terrible. @Allison, I didn't think they were terrible but I didn't think they were fabulous. Sometimes snack-girl features some recipes that are pretty unique. For example, *I* eat the cream cheese-carrot-raisin tortilla but I can't get anyone else too. When I was making them, I kept eating them, ha ha. Figure everyone will want to try one of each and then eat one more. And if you're looking for a not-so-healthy dried fruit appetizer I highly recommend bacon-wrapped dates with any kind of cheese. There are tons of recipes out there so you can tailor to blue cheese, cheddar cheese, parmesean cheese, cream cheese, ricotta cheese, etc. You can deep fry or oven bake.